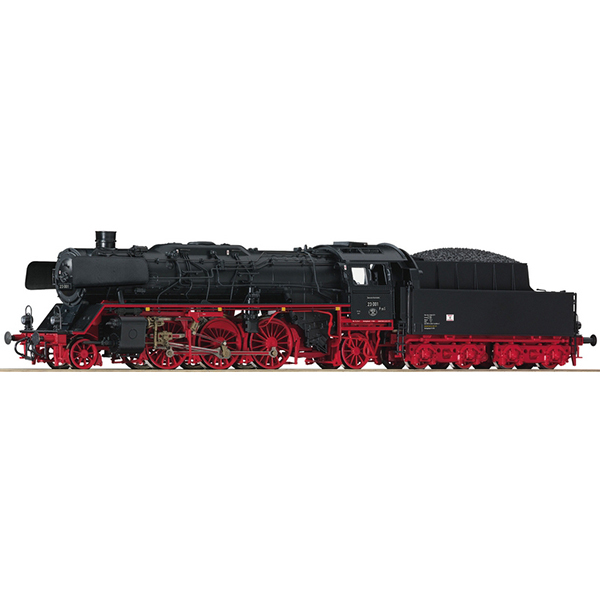 Steam locomotive model 23 001 of the Deutsche Reichsbahn. Epoch III version with REKO boiler and round smoke stack. Epoch III. Motor with flywheel. Drive on five axles, four traction tyres. PluX16 digital interface. Coupler pockets according to NEM 362 standards. Close coupler motion link between loco and tender. AC model with digital decoder and digitally switchable sound functions. Ready equipped to install a Seuthe smoke generator. Over the years, the steam locomotive 23 001 unterwent some improvements and modifications. For use as a brake locomotive, the loco had a Riggenbach counter-pressure brake and angled pressure compensation valves mounted on the cylinders. As a result of aging on the original steam boiler it was equipped with a new Reko boiler as it also had the BR 50.35 in 1961. However, because of the counter pressure brake, It had also a feed water heater fitted. Particularly striking on the redesigned locomotive was the continuous state-of-the-art trim which combined the dome and the sandbox. Thanks to its modern boiler, it has become the most powerful loco ever built under the series designation 23.